Xamarin.Forms provides a flexible cross-platform Color class. This article introduces the various ways the Color class can be used in Xamarin.Forms. Named Colors - a collection of common named-colors, including Red, Green, and Blue. FromHex - string value similar to the syntax used in HTML, eg "00FF00". Alpha is can optionally be specified as the first pair of characters ("CC00FF00"). FromHsla - Hue, saturation and luminosity double values, with optional alpha value (0.0-1.0). FromRgb - Red, green, and blue int values (0-255). FromRgba - Red, green, blue, and alpha int values (0-255). FromUint - set a single double value representing argb. These colors are shown on each platform below. Notice the final color - Accent - is a blue-ish color for iOS and Android; this value is defined by Xamarin.Forms. Use the Default to set (or re-set) a color value back to the platform default (understanding that this represents a different underlying color on each platform for each property). Developers can use this value to set a Color property but should not query this instance for its component RGB values (they're all set to -1). Set the color to clear. On iOS and Android this instance is set to a contrasting color that is visible on the default background but is not the same as the default text color. AddLuminosity - returns a new color by modifying the luminosity by the supplied delta. WithHue - returns a new color, replacing the hue with the value supplied. WithLuminosity - returns a new color, replacing the luminosity with the value supplied. WithSaturation - returns a new color, replacing the saturation with the value supplied. MultiplyAlpha - returns a new color by modifying the alpha, multiplying it by the supplied alpha value. When using XAML compilation, color names are case insensitive and therefore can be written in lowercase. For more information about XAML compilation, see XAML Compilation. 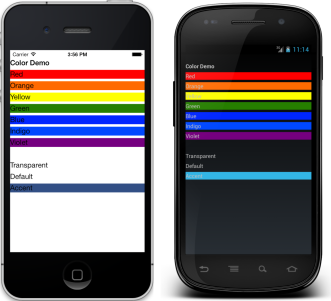 The Xamarin.Forms Color class is used to create platform-aware color references. It can be used in shared code and XAML.